A parent recently mentioned to me something about her mom making her feel guilty about the things she was doing to help her baby sleep and I thought this would be a good article topic to write about. There are co-sleeping parents whose loved ones believe in cry-it-out and don’t understand why they wouldn’t let their baby cry-it-out. Then there are parents who do cry-it-out whose loved ones don’t understand how they could let their baby cry. And, of course, there is everything in between. I am an optimist (at least I think I am) and try to find the good in people, so I remind myself that people are only trying to help and honestly feel they are giving their best advice. Those without kids that give advice, I definitely take their advice with a grain of salt. I mean I know *I* had all the answers before I had kids. It seemed so simple didn’t it? Little did I know what a loop motherhood would put me in! I guess I didn’t have as many answers as I thought, so now I don’t expect non-parents to have as many, either. “You need to make more noise when he sleeps” – He can’t sleep through noise! “Don’t let him nap” – Less naps meant more over-tiredness which meant more night-wakings! “Give him a pacifier” – Yeah because I didn’t try that when he was up every hour last night. Thanks. “Put cereal in his bottle” – No solids until 6 months old, thank you, and it can be a choking hazard*. And, see above, he was not hungry. “When my baby was 6 weeks, I just put her to bed and didn’t get up again until morning. (even if crying)” – No thank you. Not for me. “Does he have to go to sleep now?” (when people wanted to visit) – Yes. Yes he does, because the ramifications of not getting him to bed now is not pretty. The advice was endless and much of it might work for other people, but just not for me. The beautiful part is that these are my children and I’m the one who gets to decide what’s best for them. Well, okay, my husband does have a say, too. 🙂 So, I nodded my head or said we tried it and, okay, in some cases e-mailed all the benefits of breastfeeding to educate my mother-in-law people (by the way, I am pro-breastfeeding but not a strict “lact-ivist,” and feel formula feeding moms are just as loving and their babies will be just as smart as mine). When you’re struggling with your baby or toddler’s sleep and everyone around you either has “the answer” or the baby or toddler who is that perfect sleeper, it’s easy to lose confidence and wonder if you’re doing everything wrong. You might question your ability to parent. But, what I tell my clients a lot is that sometimes you do EVERYTHING right and your baby just. won’t. sleep. You can only do so much. You can lead a horse to water, but can’t make him drink is how the saying goes and it is so true when it comes to your baby’s sleep. Your job is to provide the soothing sleep environment and to give the opportunity for sleep and the rest is up to them (unfortunately in many of our cases!). When my son, now older, tells me at bedtime “I’m not tired” (when he says that every night and I know is not true and just that he doesn’t want the day to end), it is my job to set firm limits that lights are out at 8:30, no matter what. Most of the time he is asleep in a few minutes and other nights he might take 10-15 while he listens to a CD playing. Either way, I’ve done my job. And, when he was a baby, my job was to make sure we stuck to routine pretty regularly because of his temperament and get him the sleep he needed because of the ramifications if we didn’t. Sure, family members didn’t understand why we had to skip the barbecue for his nap (among many other things), but his sleep and well being came first and we knew him best. AND, we were the ones who had to get up at 10pm, 1am, 3am, etc. when he wasn’t sleeping from being overtired. They weren’t going to do it! There are many things to help promote sleep, of course, and that’s what this site is all about, but at some point you do have to let go and realize they are just going to do what they are going to do and they will have good days and bad days just like we do. All in all, YOU KNOW YOUR BABY BEST! You are the one with them day in and day out (even working parents like me!). And, you know what you can handle as a parent. We knew the result if we kept our son out too late, so we chose our special events very very carefully. They would always set us back at least a week. Our second son has been much more go-with-the-flow, so I can definitely see how people do it. It just wasn’t going to happen with our first son and it’s not because he was first. It’s just his personality, temperament, and sleep needs. It’s just how the cookie crumbles. Sleep training is work – but it doesn’t have to make you feel guilty! Our consultants at The Baby Sleep Site® specialize in creating Personalized Sleep Plans™ that are customized to your own parenting philosophy, and that will NEVER make you feel guilty or pressured. Even better, once you have your Personalized Sleep Plan™, your consultant will walk you through each step of implementing it at home. How do you handle the sleep training guilt? * Note: Some pediatricians will recommend some cereal in a bottle for severe cases of acid reflux, but please check with your pediatrician. All I want to say about this article is …..AMEN!! I feel like I just wrote this myself. My daughter is exactly like your son and I get unsolicited advice all the time! Thank you for writing this, it gave me more confidence as a mom! I too am struggling with all of the advice out there. I’m soooo confused by all of the books with different ideas and suggestions and advice from other people. this article and many of your other articles on your site are sitting really nicely with me. This article and all of the above comments make me feel so much less uptight! Unless you’ve had a baby with a “difficult” temperament, you cannot understand how important routine and structure are! There are few things as important to me as keeping my daughter well rested and this often leads to comments like “you need to teach her to be flexible,” etc. What I need to teach her is that I am providing for her needs! And sleep is one of the biggest, most important needs. We are going on a vacation several time zones away for the holidays and I am terrified of what this is going to do to her sleep, both while away and when we return. This trip was planned way before my baby was born, but if I knew then what I know now, I’d rather stay home! Oh well – at least I have the tools to retrain her when we come back! @Stephanie Those types of comments drive me crazy! 😀 I hope the trip goes well!! Many babies do much better than you anticipate. Good luck! @Cynthia At 4 months, schedules are hit and miss, so no, I would not wake him to stick to a feeding schedule. At this age it’s best to keep wake times short and nap often. 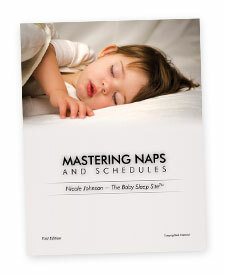 30 minutes to an hour is normal at this age as short naps are common up through 6 months old. It sounds like you’re doing a great job, mommy! Hi there! I was sooooo grateful to find your website, and especially this article…. My 12 week old son Forrest is my first baby, and it has been one hell of a ride. After about 5 weeks he started having almost daily spans of 12 to 15 hours awake with only occasional 20 minute naps. I was also struggling with post-natal depression (not helped by sleep deprivation and frustration! ), and his obvious unhappiness made me feel even more guilty, not helped by the advice from articles and health visitors that he would sleep when he needed to and that to try to sleep train him would be in some way damaging to him. What I couldn’t get anyone to realise was that those 12 – 15 hours of awake times were with rocking, a pacifier, cuddling, napping together, nap-nursing, patting, singing, pacing, etc….he just wouldn’t sleep properly. He had gone from being a happy, alert little baby who had put on weight consistently to being a miserable, whining little goblin…and the sleeplessness even began to affect his health when he became too tired to feed properly – fussing constantly, dropping off to sleep after 5 minutes, only to wake again 5 minutes later, wanting to feed like that for 3 hours straight, and his weight gain dropping to only 2 oz at week 6. We spoke to health visitors, breast feeding counsellors and our doctor, all of whom told us it was just colic and we’d have to just get through it – not what you want to hear when you’re depressed! Fortunately, my mum bought us a baby book where I happened to read that young babies can’t stay awake for longer than 2 hours without becoming over tired….and that they need regular naps during the day as well as sleep at night. Something clicked in our heads! He was tired – really, really tired. We started giving him a bed time of 7pm (obviously with feeds during the night) after which he was in his cot, in the dark, and the improvement was incredible – he became instantly more manageable. But he still wasn’t napping, so we decided to just put him in his cot when he’d been up for 2 hours and to keep going in and cuddling him every 5 -10 minutes, but not talking to him and keeping the light low. He protested a lot, but after 1 day he was already dropping off to sleep during those nap times and after 3 days he was often falling asleep without any crying at all! And what was best was that he was back to being a happy, curious, alert little boy, gaining 6 oz a week and developing and growing even faster! We’re still working on naps, because any tiny change sends him right back to the start, but I’m feeling more and more confident about my parenting ability and our understanding of his needs and personality is blooming. I’m sure that this experience will make us stronger and more intuitive parents, and has been a great lesson in the importance of boundaries and active parenting. Thanks so much for your website, it’s great to find more reassurance, even though we did start at 7 weeks old! It just goes to show that every situation is unique! feeling much better, see ya! @veronica Thanks for sharing! I had a lot of trouble falling asleep even after my son slept better. I was visiting family this past weekend. My 5 month old son has an early bedtime. Every single parent there gave me a hard time about his early bedtime. They said I was too ‘rigid’ and ‘neurotic’. My sister-in-law even suggested that my son wouldn’t succeed in preschool because he’d be unable to ‘transition’ from task to task because I’m so ‘rigid’ with his bedtime and sleep. So, I caved and had him up over an hour past his bedtime. I knew better, but every ‘experienced’ parent there had me doubting my parenting skills. That night and the next few days reminded me why he goes to bed early and why I’m so ‘structured’ – NOT ‘rigid’! @T I found I had to be “structured” (I like that :)) when my son was a baby and now that he’s gotten older, we still have to be routine and structured, but not as much so. We also learned the hard way why we had to just ignore other people and put our son to bed when he needed it. It set us back a week, minimum, when we’d miss naps or mess up his schedule too much. Sure, we missed some barbecues, but we had to be choosy about what was worth the upset. Thanks for commenting! @Patricia I know what you mean about giving up on explaining to people. It falls on deaf ears a lot of times (not always, thankfully). Children thrive on routine, so it sounds like you’re doing great! Just yesterday, my best friend, who is currently struggling with her baby’s lack of sleep, tried to make me feel guilty for teaching my baby how to fall asleep on her own, by saying that babies need to be rocked otherwise they don’t feel loved…I have to admit that for a minute I felt guilty, but then, this morning, when I saw the smile on my baby’s face from having a whole night of good sleep, all that guilt went away. In order to compensate the sensation of having my baby fall asleep like an angel in my arms (which I have to admit is wonderful), I am holding her and hugging her more than ever, but not when it’s time for her to go to bed. @Ana Carolina It’s hard not to feel guilty about many things, not just sleep! That’s our jobs as mothers. 🙂 And, for what it’s worth, I went on to rock both my boys a lot, just not all the way to sleep if I could help it. 😉 After they knew how to sleep, they went down asleep many times, too. I agree that there are many hours in the day for you to hug and kiss them and it’s better not to get in the way of better sleep, if you can help it. Thanks for commenting! Great article! All of it is so true. Nicole, when did you (if you have) stop using the sound machine? I feel like if I were to not use it that it would be DEAD quiet in there. Plus it would make it hard to sneak in there without making a noise. But I think it’s just my hangup. Oh, my goodness…I could have written this post. In fact, I probably have a few times on my blog. My MIL always puts her “advice” in the form of “I just can’t believe…” I just can’t believe that he goes to bed so early and sleeps so long. If you kept him up later, y’know you’d get more sleep. I can’t believe that you still let him take 3 naps, and he actually sleeps through the night. Umm, it’s BECAUSE of the 3 naps that he sleeps 12 hours straight at night. When he misses a nap (((shudder))), he’s a frantic mess. She’s also convinced that I’m starving him by breastfeeding him and I should get him a “nice, soft mattress”. Nicole, I get the same unsolicited advice from my mother-in-law- that I should keep my baby up later! It really upsets me when I try so hard with my sleeper who is similar to your older son and then (not knowing anything about my baby at all), she tells my husband that I put my baby to bed too early. @Cindy It’s hard for other people to understand our challenging sleepers. You know him best and you’re the one who has to deal with the consequences if your baby goes to bed too late and doesn’t sleep well. Hang in there and stick to your guns! Your MIL raised her kid (your husband) and now you get to raise yours. 😀 Of course, sometimes these are difficult issues to deal with, but just know you are not alone.